Tejon Ranch is a precious and irreplaceable piece of California's natural heritage--a hotspot of biological diversity that lies at the confluence of four major biogeographic regions. It is a haven for rare and endemic species, ancient oak trees, endangered California condors, rare native vegetation communities, and intact watersheds and streams--and all so near the largest metropolitan area in California. This report synthesizes available scientific information for the Tejon Ranch region to raise public awareness about its significance to the conservation of natural diversity and to encourage comprehensive, landscape-level planning to protect its unique values. We present this information in the hope it will inspire the Ranch's owners, the public, and governmental decision-makers to work together to protect this unspoiled natural treasure. Since the early years of California statehood, Tejon Ranch has served as a natural laboratory for scientists studying natural history, biogeography, and the products and processes of evolution. Historic field studies here in the late 1850s significantly advanced scientific knowledge about the plants and animals of the West, and ongoing research in the region continues to further our understanding of how species and ecological communities evolve, function, and interact. Scientists have demonstrated how dramatic geological and climate changes have produced an amazing history for the Tejon Ranch region--a crucible of evolutionary innovation and species diversification. It potentially supports as many as 20 state and federally listed species and over 60 other rare species, including many species or subspecies that occur nowhere else on earth! It supports 23 different vegetation communities, a high percentage of the total number of communities in the region, and over one-third of the oak species in California, including some of the largest individual oaks in the state! The Ranch supports several habitat types that are rare and under-protected in the region, including grasslands, fir forests, and significant stands of valley and blue oak woodlands. The Ranch's grasslands, in particular, represent a final opportunity to preserve a connection between grasslands remaining on the western and eastern flanks of the San Joaquin Valley, which are otherwise becoming isolated into non-interacting and therefore diminished ecological communities. Moreover, substantial conservation of the Ranch is crucial to maintaining the viability of existing conservation investments in the region, such as the Sequoia and Los Padres National Forests and Wind Wolves Preserve, which depend on unrestricted movement of the species they support. Tejon Ranch meets nearly all of the Priority Criteria for Conservation established by the California Resources Agency. The California Wilderness Coalition named Tejon Ranch one of California's Ten Most Threatened Wild Places. 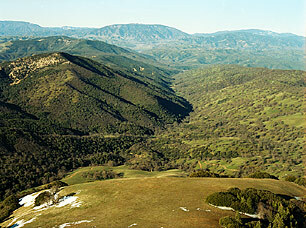 Audubon California has identified the Tehachapi Mountains around Tejon as an Important Bird Area. Los Angeles County has designated Significant Ecological Areas on the Ranch and is considering expanding the area under this designation. Habitat for the endangered California condor and important for recovery of many other endangered San Joaquin Valley species. Significant urbanization is proposed for the Ranch, threatening to fragment and degrade this remarkable natural area and the surrounding region. Decisions over the fate of Tejon Ranch, and implications to the region, should only be made via comprehensive, multi-jurisdictional planning at a regional scale. Such planning should occur in a public arena and should be guided by the best available science to balance economic development with protection of the Ranch's irreplaceable natural values. California's heritage and future quality of life are at stake in the decisions that are being made today. Copyright © 2003 Save Tejon Ranch.